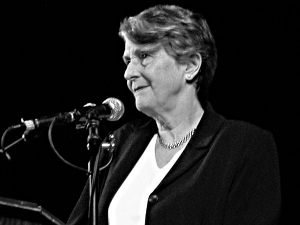 Dr Helen Caldicott, anti-nuclear activist, humanist, physician, returned to Bermagui on 10 February during a week when South Australian Premier Jay Weatherill’s Nuclear Fuel Cycle Royal Commission was preparing to deliver its “Tentative Findings”. Dr Caldicott was speaking at the Bermagui Institute dinner; her topic was “Nuclear South Australia”. The speaker shared anecdotes from her forty years of campaigning, detailed the hazards to human health and the environment presented by the nuclear industry, and advanced three main points: one, that the recent search for a site to store radioactive waste from Australia’s only nuclear reactor is premised on a lie; two, that Premier Jay Weatherill’s pursuit of a nuclear industry for SA is unnecessary and dangerous; and three, that public education and the democratic process are the only means by which nuclear expansion can be curtailed. Lucas Heights was built in the 1950s, in the days when the Menzies government anticipated a nuclear-armed future for Australia. A small reactor was installed, initially for the production of medical and industrial radioisotopes. The British supplied the technology in return for the option to test their nuclear weapons in Australia (at Maralinga, Emu Plains and Montebello in 1956-57). Some 13,000 local Aborigines, and Australian service men and women, died from radiation related diseases in the years to follow. For some time now, Dr Caldicott told us, radioisotopes have been produced in cyclotrons, a cheaper method resulting in no radioactive waste. But Lucas Heights persists in using its reactor and adding to the stockpile of highly radioactive waste needing safe storage—for thousands of years. Since Lucas Heights started producing waste, various storage methods have been tried. All have failed. In the end all waste was sent to France for reprocessing, on the understanding that Australia would take back the resultant “intermediate-level” waste. And in recent months France has started shipping that waste back; 25 tonnes in 170-litre canisters entered the port of Newcastle in December and is now ensconced back at Lucas Heights until a permanent national dumping site can be found. Six sites have been proposed (one, at Hill End in NSW, has already been ruled out). Five small rural communities await to hear their fate. Of course, long term storage of radioactive waste is not just Australia’s problem. Around the globe there are hundreds of thousands of tonnes of nuclear waste of varying grades awaiting a final resting place. And in South Australia, Jay Weatherill is promising huge economic benefits for taking and storing not just Australia’s own radioactive waste, but the world’s. Weatherill sees possibilities for nuclear power generation, enrichment and waste storage facilities in SA. BHP Billiton’s Olympic Dam mine is the largest known single deposit of uranium in the world; its uranium could be processed and used locally rather than exported. Weatherill is also proposing small modular reactors to isolate plutonium from the world’s radioactive waste, to find a site in SA to store the waste from that process indefinitely, and to use the enriched plutonium to power SA’s “emissions-free” future. Foreign countries would indeed pay happily for SA to take their dangerous waste. But there are holes in Weatherill’s plan. Firstly, much of SA sits over the Great Artesian Basin, the only reliable source of fresh water through much of inland Australia and the basis of agriculture in large swathes of SA, NSW and QLD. 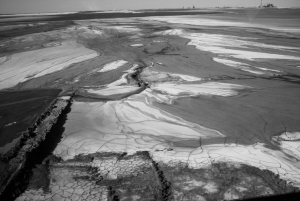 And no leak-proof storage method for nuclear waste has been found. The Americans became so desperate that they tried to shoot a rocket-load into space, said Dr Caldicott. The venture failed miserably. They have taken solace in their Nuclear Regulatory Commission’s 2012 “Nuclear Waste Confidence” ruling, whereby waste can be generated and stored for 100 years in confidence that a safe storage method will one day be found. This ruling delighted the US nuclear industry, which was able to start up again after a hiatus for environmental concerns. Back in SA, Jay Weatherill has hitched his nuclear plans to the premise that nuclear power is free of carbon emissions. It’s true that nuclear power generation is emissions-free, but the mining of uranium ore, the crushing of ore in mills and its enrichment are all very emissions-intensive processes. The building of a reactor requires vast quantities of concrete, which is a major global source of carbon emissions. And spent fuel rods must be water-cooled for years; the pumps circulating the water are fossil-fuel-powered. A life cycle analysis carried out by Jan Willem Storm van Leeuwen and Philip Smith concluded that electricity from nuclear energy emits 90 to 140 g CO2 per kWh of electricity produced (depending on the ore quality). This compares unfavourably with electricity from renewable sources (solar, wind and water) which ranges from 10 to 40 g CO2 per kWh. Dr Caldicott told us that Weatherill is under pressure from the nuclear industry. In 2010 University College London (UCL) set up a campus in Adelaide. UCL is funded by pro-nuclear and pro-shale-gas corporations such as BHP Billiton and Santos. A number of figures prominent in UCL are also active in the nuclear industry. Rupert Murdoch’s News Corporation, the owner of South Australia’s only two newspapers, is firmly behind the industry. Meanwhile, SA’s automotive industry is in its death throes and mining is suffering. The Premier needs a new direction for his state. Education is the key, said Dr Caldicott, citing example after example of public and professional protests resulting from education campaigns across Australia, New Zealand, Europe and the United States. Christine Poulton, in her introduction on the night, told of when Dr Caldicott entered her consciousness—addressing a crowd at the 1976 Hiroshima Day Rally at in the Melbourne CBD. The activist had exhorted the crowd, hundreds of them, to join her and lie down on the ground for a minute’s silence. Christine lay beside the Swanston Street tram tracks and listened to the temple bell tolling for the victims of those two bombs. “It’s only when you inform the public as a whole that [politicians] respond to the medical and ethical issues,” said Dr Caldicott. Five days after Dr Caldicott’s talk in Bermagui, the SA Royal Commission released its tentative findings. As expected, it found that SA could benefit from the development of an “interim storage facility” for intermediate level waste, and, later, “geological storage” for high-level waste. It did not nominate a site. But on the question of power generation, the Commission found that it would not be commercially viable for SA to generate nuclear power in the near future. “Our relative isolation from interstate limits our ability to import and export electricity,” the Commissioner, Mr Kevin Scarce, said. Mr Scarce is unhappy about some portrayals of the waste storage plan. “It’s a sophisticated engineering facility, with world-class infrastructure,” he said. He wished media “would not use the word dump”. This entry was posted in Jen Severn and tagged Bermagui Institute, environment, politics. Bookmark the permalink.